Contemplate the way forward against a beautiful backdrop. With stunning views to rival the insights from our keynote speakers, the River View Room at Optus Stadium – the home of State of Social – is a suitably memorable venue for our unforgettable event. 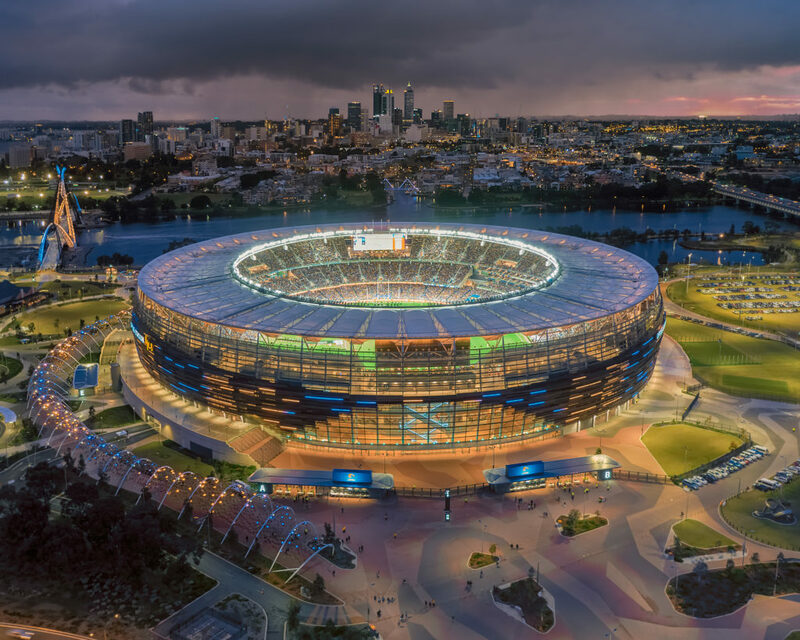 As Australia’s third largest stadium, the 60,000-seat Optus Stadium is a world-class sporting and entertainment venue nestled within leafy Stadium Park on the banks of the Swan River. The River View Room is equipped with the latest technology, ensuring a seamless conference experience, with floor-to-ceiling windows providing a picture-perfect panoramic backdrop. #SMPerth Drinks will be held in the Locker Room. Located at the edge of the playing surface, this space offers a relaxed environment with views of the team warm-up facilities and a ground level view that is hard to beat. All #SMPerthSOS delegates will have access to #SMPerth Drinks. A limited number of drinks only tickets will be made available closer to the event. UBER/TAXI: A drop off point is located within Marlee Loop, off Victoria Park Drive. CAR: Car parking is available within the Camfield car park and the Bus Station. To access parking, enter Roger Mackay Drive, off Victoria Park Drive, turn right at the roundabout and enter the Bus Station. Parking is available here or take the first left to enter the Camfield car park. Enter through Gate D and up to the Level 1 external concourse via the lift or staircase. Follow the concourse to the left and enter through Western Entrance 7 or 8. Once inside the Stadium make a right turn, follow the internal concourse and take another right turn towards lifts, escalators or staircase and up to Level 3. Enter into the foyer and through to the River View Room. There will be guided signage throughout the stadium.